have many shirts to choose from. 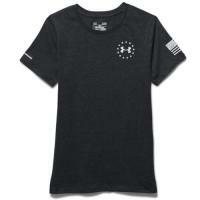 Show your support for your country with this women's tactical short sleeve t-shirt from Under Armour, which features the flag on the sleeve. It is made from a tri-blend fabric of cotton, polyester and rayon, making it soft and comfortable while enhancing performance. The lightweight stretch fabric and relaxed fit improve mobility, perfect for active wear. It also features Under Armour's signature Moisture Transport System, which wicks sweat away from the skin to keep you dry and comfortable. Anti-odor technology fights off odor-causing bacteria, keeping your shirt smelling fresher for longer. The shaped hem provides plenty of coverage without giving you a bulky silhouette.